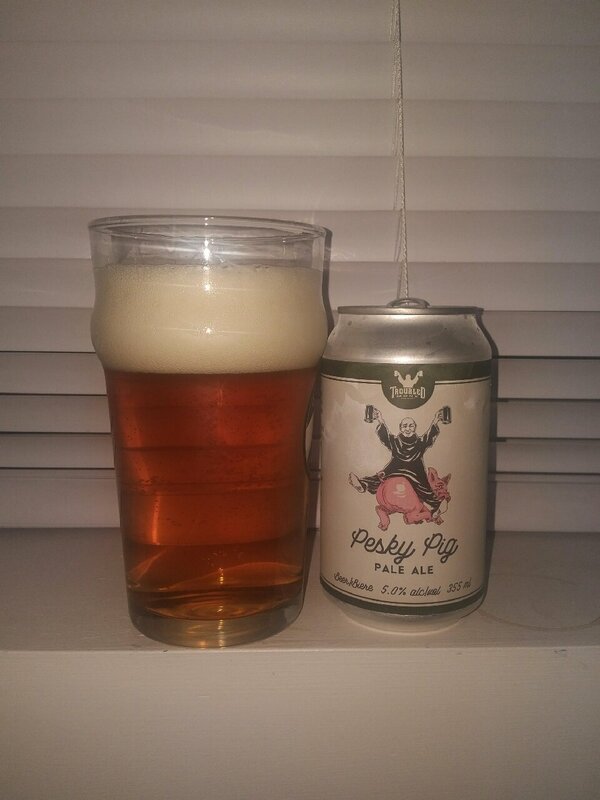 From Troubled Monk Brewery in Red Deer Alberta comes their “Pesky Pig Pale Ale”. The beer pours a golden to light copper with a white head. The aroma consists of floral hops, mild dankness, grassy, grain and a mild hint of citrus. The flavour is of grassy hops, earth, resin, citrus, grapefruit rind, grain and a fairly good hops bitterness kick at the end. This is a West coast pale ale through and through. The alcohol content comes in at 5%. This beer boarders on some of the IPA’s on the market. It’s good stuff! Commercial Description: Pesky PIg Pale Ale is named after Francis the Pig who stole the hearts of carnivores and vegetarians alike in the summer of 1990. This 220 pound porker evaded his fate by jumping a wall, navigating the slaughterhouse and escaping into Red Deer’s parkland. It was 5 months before this feral fugitive was finally captured. Raise a glass to the little piggy that never went to market. Rejoice that he left these pastures on his own terms; proving you can’t tame a free spirit. This entry was posted in Pale Ale and tagged bitter, bitterness, citrus, dank, earth, earthy, grain, grainy, grapefruit rind, grass, grassy, hops, hops bitter, hops bitterness., hopy, pale ale, pesky pig pale ale, troubled monk brewery, west coast pale ale.